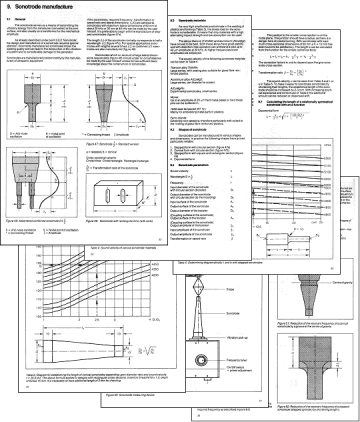 ZVEI (the German Electrical Manufacturers Association) produced a handbook some 20+ years ago covering all aspects of ultrasonic plastic welding equipment design and manufacture. This book "Ultrasonic assembly of thermoplastic mouldings and semi-finished products - Recommendations on methods, construction and applications", remains highly relevant today and the section on sonotrode (horn) design, manufacture and tuning is the best publicly available information I know on this topic. ZVEI has kindly given me permission to reproduced the relevant section here. The complete handbook is still available direct from them: Sonotrode design and manufacture (from ZVEI Handbook).